A high school student in Texas refused to stand for the Pledge of Allegiance. She was expelled when she repeatedly refused to stand. Now she is suing the school. This happened at the Cy-Fair ISD in Houston. Seventeen year-old India Landry says, “I don’t think that the flag is what it says it is for, for liberty, and for justice and all that. It’s not obviously what’s going on in America today.” I would say it’s a good bet this case may be on its way to the Supreme Court. This is a public school and it involves freedom of speech, but it’s not as simple as that. There are agreed upon rules in public schools that kids and parents agree to when a child attends that school, so that particular free speech argument may not pass muster. I might just point out that if the school is forced to comply with this, then freedom of religion must also be observed in schools as a First Amendment right that sits right along free speech. See above. Separation of church and state is not in the Constitution and in my viewpoint therefore is not valid. And you won’t find it in the ‘good and plenty clause’. But regardless, if you allow one instance, you must logically allow the other. Landry says she has not stood for the pledge for years and they finally kicked her out last week for it. It should have been done long ago. She called the school condescending and stated, “This isn’t the NFL, you won’t do this here.” Good for them. And I would take this one all the way up the food chain. It’s the constitutional principle of the thing. 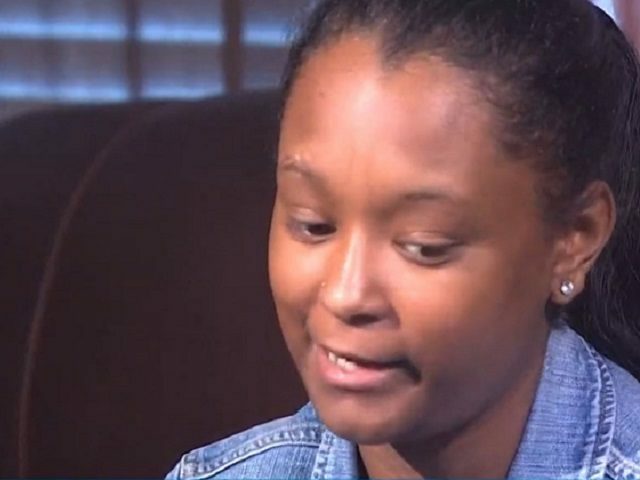 The girl claims that the head principal saw her sitting during the pledge while she was in the administration’s offices. Principal Martha Strother told her to stand, and when she continued to sit, Strother allegedly told her, “Well, you’re kicked outta here.” Again, slow clap for the principal. The liberals are in a Catch-22 here. If they insist on the freedom of speech stance, they must allow for freedom of religion for Christians/Jews as well. It’s either all in, or all out. Constitutional rights are not by definition ‘selective’. A statement from Landry’s attorney, Randall L. Kallinen, states that the black female student at Windfern High School sat through the Pledge of Allegiance at least 200 times since April 2016. Kallinen says “Principal Strother had recently been whipped into a frenzy by African-American National Football League players kneeling for the Anthem.” Prove it. And it is an irrelevant point. Rules are rules, even for black students. Kallinen says the issue of a student having a right to not stand for the Pledge of Allegiance has been settled for years. No, it hasn’t been. He also urges that, “Instantaneous school expulsion violates the Constitution.” Wrong… he obviously knows less than nothing about constitutional law. “Students cannot be instantly expelled except for being a danger,” said the Houston-based civil rights lawyer. “The only danger appeared to be that her sitting whipped Principal Strother into a political frenzy.” Not true, students can be expelled for not following the rules and for a myriad of reasons. This guy is lying and has no idea what he is talking about. Landry told the Houston CBS affiliate that she does not know when she will be able to graduate. Hopefully, never from that school. Her attorney is a moron and I would call over 200 violations of a school mandate the opposite of ‘instantly’.